A unique two bedroom Grade ll listed semi-detached cottage (Circa 18th century), situated at the heart of Kemsing Village nestling at the foot of the North Downs and in an Area of Outstanding Natural Beauty. In need of a programme of tender loving care this delightful period cottage offers the discerning purchaser a rare opportunity to not only upgrade the cottage throughout but also to extend both to the rear and to the side. (STP). Internally the accommodation is arranged over two floors, on the ground floor a beamed sitting room with a Claygate fireplace and French doors to the side garden, a kitchen with access to the garden and the bathroom. 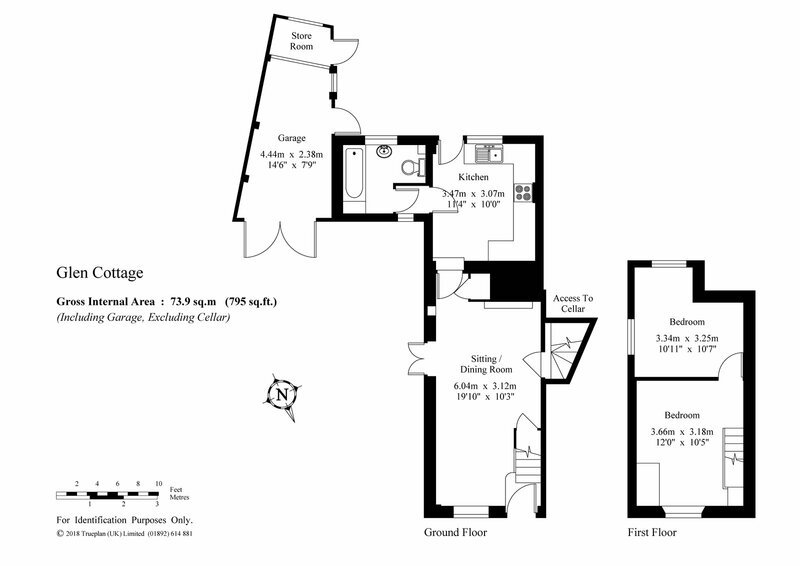 the cellar provides a useful storage area, and the on first floor there are two bedrooms. To the side of the cottage is a good sized garden with access to the single garage which is set back from the property. The rear garden is delightfully secluded with mature shrubbery. With gas central heating and original sliding sash windows. Front Small picket fence, flower borders, side garden and drive to garage. Part natural brick and part tile hung elevations under a peg tiled pitched roof. Wall lantern. Sitting Room 19'10" x 10'3" (6.05m x 3.12m). Solid wood door to front. Stairs to first floor. Sliding sash window to front. Wood floor. Radiator. Door to cellar. Claygate fireplace. French doors to side garden. Beamed ceiling. Wall lights. Cupboard housing hot water cylinder. Latched door to kitchen. Under stairs storage cupboard. Meter cupboard. Kitchen 11'4" x 10' (3.45m x 3.05m). Glazed door to rear. Casement window to rear. Kitchen units. Single drainer stainless steel sink unit. Wall mounted central heating boiler. Work tops. Free standing cooker with extractor above. Space for washing machine. Space for fridge freezer. Quarry tiled floor. Door to lobby. Lobby Window to front. Door to bathroom. Bathroom Window to rear. Pedestal wash hand basin. Panelled bath. Wall mounted shower. Storage cupboard. Low level WC. Radiator. Bedroom One 12' (3.66m) (12' (3.66m) x 10'5" (3.18m)). Sliding sash window to front. Fitted wardrobe. Wall lights. Beams. Radiator. Garden Paved patio. Fully fenced and secluded. Laid to lawn. Flower beds. Garage 14'6" x 7'9" (4.42m x 2.36m). Pitched roof. Double doors to front. Part mezzanine storage space. Door to garden. Partition to timber lean-to with windows and door to rear.